Synopsis: “Young Sean Anderson (Josh Hutcherson, reprising his role from the first film) receives a coded distress signal from a mysterious island where no island should exist. It’s a place of strange life forms, mountains of gold, deadly volcanoes, and more than one astonishing secret. Unable to stop him from going, Sean’s new stepfather, Hank (Dwayne Johnson), joins the quest. 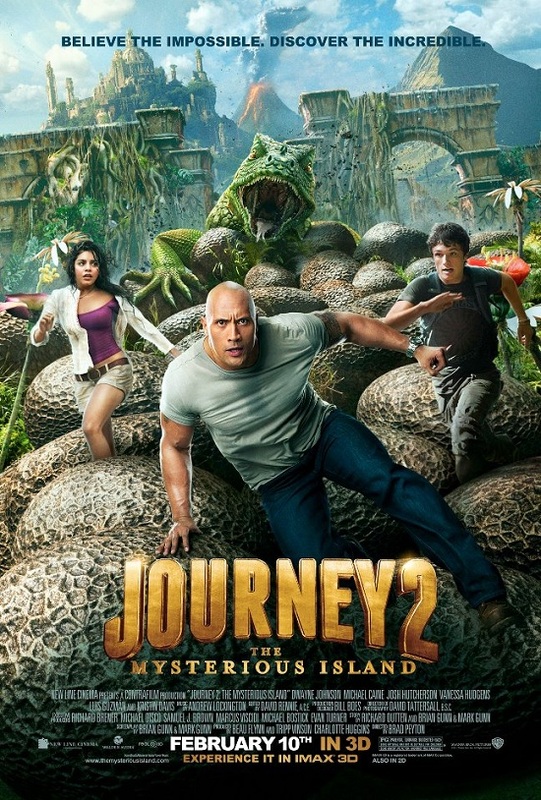 Together with a helicopter pilot (Luis Guzman) and his beautiful, strong-willed daughter (Vanessa Hudgens), they set out to find the island, rescue its lone inhabitant and escape before seismic shockwaves force the island under the sea and bury its treasures forever” (Warner Bros Pictures). Verdict: Once again, Dwayne “The Rock” Johnson landed himself onto a fatherly role of a kids’ film, showing off his guitar and singing skills. I thought there would never be another instalment of this franchise after the horrible Journey to the Centre of the Earth in 2008. When you produce a film based on such great classic novels, you’re challenging the imaginations of the readers. And I’m sure they would all be disappointed with Journey 2: The Mysterious Island. It has better predictable humour than the first film but everything else is weak. The whole movie is such a rush and lacks of details, it feels like a preview of the novels that film’s loosely based on. The lines are cheesier than cheese, and the CG effects aren’t impressive. Simply put, there’s nothing much to see on the island. It was nice staring at Vanessa Hudgen‘s cleavage throughout the movie though. Oh, probably that’s why it’s rated PG-13. To watch in 3D? I won’t pay to watch it at all if I were you. But if you’re gonna watch it in 3-D, watch it at an IMAX cinema. Normal cinemas cannot cater to the effects of almost any 3D films. Second opinion: “The whole movie’s damn lame” (Iris Loong). Special thanks to Ivan Chan for the invitation to the preview screening. only 1/5 ahh..hmm . . . This is one of the best and straightforward review that I've read! Well, I guess I'll check the Underworld movie.